I don’t feel as though I can stress enough just how beautiful this book is. 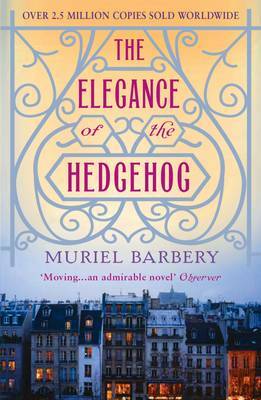 Barbery’s style is so perfect and so utterly captivating I found myself completely hypnotised, both by the story itself, and the sheer elegance with which it is written. I enjoyed this so much I insisted that my partner watch the film adaptation ‘La Herison’ with me. As to the film, while not bad in itself, it is nothing compared to the book. Renée Michel is a concierge, and self confessed member of the lower class, despite being fantastically intelligent, she knows her place, and sticks to it, stating that to be “poor, ugly and, moreover, intelligent condemns one, in our society, to a dark and disillusioned life, a condition one ought to accept at an early age”. Renée lives a secret life, reading Russian literature in the privacy of her lodge while donning the air of a simpleton when speaking with the inhabitants of number 7, Rue de Grenelle where she works. Upstairs in one of the 4,000-square-foot luxury apartments Paloma Josse is planning to commit suicide. She is an incredibly intelligent 11 year old girl, so disillusioned by the world in which she lives that is does not see the point in carrying on. She begins to write a journal of profound thoughts, and observations on the movement of the world, in a vague attempt to find a reason worth living. When an elderly inhabitant of the apartment complex passes away the whole place comes alive with excitement, at the idea of a new face setting foot inside the walls. Karuko Ozu moves into the late Pierre Arthens apartment and forms an unlikely friendship, with Paloma Josse, with whom he shares his suspicions that their faithful concierge Madame Michel is not all she appears to be. The unlikely friendship leads to the unison of three souls, almost inseparably fused together. This could possibly be everything Madame Michel needed, and just the thing Paloma was looking for as a reason to live. I cannot go into further detail for ruining the plot, and I very much hope that anyone who reads this will make the effort to read the book. Barbery’s writing had just the effect that a good book should. When I reached the last pages I felt emotional, fulfilled, and somehow devastated that I was closing the book for the last time.